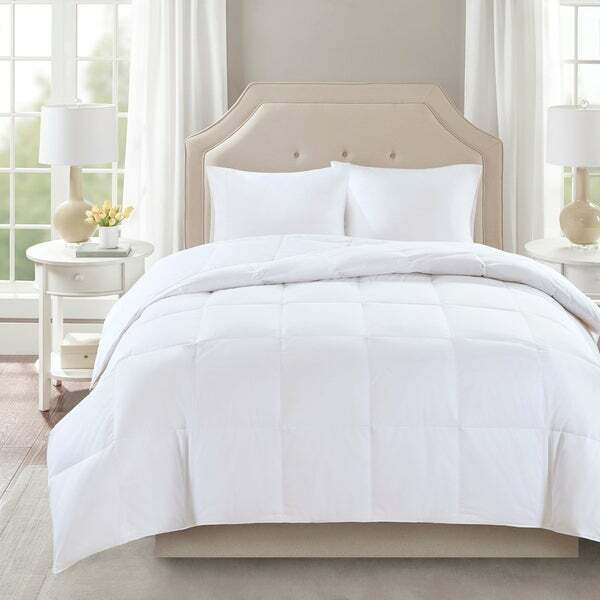 Enjoy the plush, cozy warmth of down with this luxurious down comforter. Featuring 3M Scotchgard stain release protection, the comforter stands up to wear and tear and is machine washable for easy cleaning. The soft, 300 thread count cotton cover is soft and breathable, while the down fill remains evenly distributed thanks to box quilting. I was specifically looking for a Queen duvet that would be close to the same size as a duvet cover I just purchased. Full/Queen duvets are so often much smaller than the cover, but not this one! It is only two inches shorter than my cover so it fits beautifully. And, it is so fluffy! It washed very well, and I didn't see any feathers leaking after washing it. I tend to sleep somewhat hot, but even as this is a level 2, I am sleeping very comfortably under it. It was a great price as duvets of this quality are often at least twice, if not three times as much. I absolutely love it so far! This was purchased for my duaghters room and We have only had this comforter for a day but love it already. I usually do not buy theses sorts of things online as like to see and feel the quality of these sorts of items before I purchase. We took a gamble as we had a good coupon and this comforter did not disappoint, we like it so much that we are already considering buying a king size for our room. It is a level 2 comforter which will work well for an all season duvet and perfect for Florida winters. At first I thought it felt a bit thin but once fluffed the duvet had a good loft and filled the duvet cover nicely. The queen size was perfect fit for our daughters full size bed as it came down the sides the full mattress thickness which is what we were hoping for. We also like the fact that this cover is stain resistant which I am sure will come in handy for an 8year-old’s bedroom. I would definitely recommend this duvet for anyone looking for a good quality all season duvet at a reasonable price. Love this comforter!! great quality and true to size. highly recommend this bedding product. Wonderful in general, and especially for the price. It's not $500+ down duvet...it does rustle a bit and it's more feathers than down, but that does not bother me in the least. I did a lot of research before buying this one. The baffles are full squares. It's good to fluff it once a week--just do it. It's a little flat out of the bag but comes to life after a day and especially over the course of a week. Rustles a bit inside the duvet cover but I have no issues with it being "loud." This is just how a down comforter with scotchgard is going to be (even much more expensive ones). It is so much nicer than my "down alternative comforter" (no down alternative can beat real feathers and down) and because I used a coupon it was not any more expensive than the alternative one. A nice weight for chilly mid-atlantic nights but not at all too warm when it's hot out. Great buy. This comforter was beyond my expectations. It has a luxurious feel and is generous with the fill. Nice warmth too. This will be short &amp; sweet, I hope. I am very pleased with my True North by Sleep Philosophy Level 2 Down Comforter with 3M Scotchgard Treatment. I especially like the smaller bafflin(squares) because the down doesn't meander over to another square. My other comforter looks like I have saddle bags on the sides where down has drifted down. May be a little noisey for some, but it's fine for me. It is just right for some of the extra cold we've had &amp; when it warms up, I just fold it to the side, because I'll want it by morning. For me, Good buy!! I had seen this comforter being sold for a good deal & figured that it would be well worth it. It arrived today & after airing it outside & putting it in the dryer to fluff, it's still flat. Considering I had bought a 650 fill power comforter in the same order that is super puffy, fluffy, soft & warm, I didn't expect there to be too much of a difference but yeeeeeeeeeeesh! I guess it's not the worst I've seen & had but I'm definitely claiming the other comforter for myself. As the price is great, I've added an extra star but really expected a little more puff to the fluff. YES! Just what I was looking for! This is my second down comforter in three years. The first was very highly rated but was very disappointing. Several baffles were not sewn through so the down quickly shifted to one side and no amount of shaking or dryer cycles ever evened it out. It always looked horrible on the bed - one side lumpy and the other side flat. I finally got fed up and bought this one and it is exactly what I expected. It is box-stitched so the down does not shift. Hallelujah! I've used it for three months now and it has not let me down. It keeps me warm and cozy on frigid New England nights and always looks evenly lofty on the bed. I love it! Love this comforter. We use it year round. We have washed it and dried it with tennis balls. It's a nice size. Some comforters aren't as wide as this one. Super comfortable! A bit crisp, but that’s great on warmer evenings, and I’m positive that will soften up on washings. With pets, I’m loving the Scotchguard - such a great feature! We have one of these comforters for our bed and use it year-round. We liked it enough that we ordered the twin size for our son's room. Pretty much matched our expectations and may order another one for the guest room. Kind of thin for price. Material is soft. This was a gift for my daughter and she loved it. I have the same comforter and on my bed and it is light weight but still warm enough for Texas winters. It feels flat and kind of stir. Not fluffy at all. A bit warmer than I wanted, but I live in Florida so should have known better. Great fill or puffiness. I love the oversized look and feel as there is no fighting over the covers. Showed up in a day and so far so good! Somewhat of a smell, but nothing out of the ordinary. Decent weight, puffy, comfy. Fluffed up nicely and makes my guest bed look crisp and clean. I had mixed reviews on warmth. My son and his wife said it was plenty warm. However my dad said he still needed a blanket. My only complaint is that my guest bed is a full and the queen comforter looks a bit big on it. "Is the fabric protection treatment safe? I've heard mixed reviews about how toxic Scotchguard can be and I just want to make sure something that is going to be touching my skin nightly and up around my face isn't detrimental to my health." I have no idea. I haven't had my comforter for several months and haven't experienced any problems. I use a duvet, but experienced no discomfort or negative effects while handling the comforter directly. Thus far, we have not received any complaints about the Scotchgard element of this product . However, if you are concerned, we do recommend you use a duvet cover for the comforter for peace of mind. Please feel free to contact us if you have any further questions or concerns. "Does the manufacturer make covers for the queen size comforter"
"which is warmer the level one or the level two? Also, what is the difference between the two?" Level 2 would be the warmer blanket. The difference between these is the weight of the blankets. "What is the feather/down ratio? thanks"
Looking for a medium weight high quality comforter -- hope it turns out to be! Like a good deal plus everyone that has bought it has been extremely happy.